Swivel shackle head for unlimited block rotation. 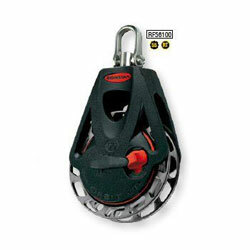 Stainless steel shackle head for ultimate durability and compatibility with harsh fixing points. Auto & manual ratchet engagement modes. Up to 20:1 holding power. Halyard, vang and backstay applications on boats to 8m (26ft). Control line applications on larger yachts. Sheave : Hard anodized aluminum.